The silver-gilt hilt consists of a pommel made of two lions’ heads, back to back, one looking forward, the other to the rear, and a pair of quillons, arising from a rectangular quillon-block, flattened at right angles to the plane of the blade, with their rounded ends curving gently towards the pommel. The edges of the quillons are decorated with serpents, their necks entwined. The surface towards the hand is overlaid with a thin translucent panel of brilliant red composition resembling enamel, over which is applied, on each end, the head of a bearded man backed with acanthus foliage, and, on each side of the grip, an eagle, all in low relief. The surface towards the blade bears two hand looking-glasses in relief inscribed, on the one, 'Boutet/ Directeur/ artiste, and on the other, Manuf/ A/ Versailles'. In front of the quillons is a water-guard to fit over the mouth of the scabbard, decorated in low relief with egg and dart, each egg charged with a palmette. 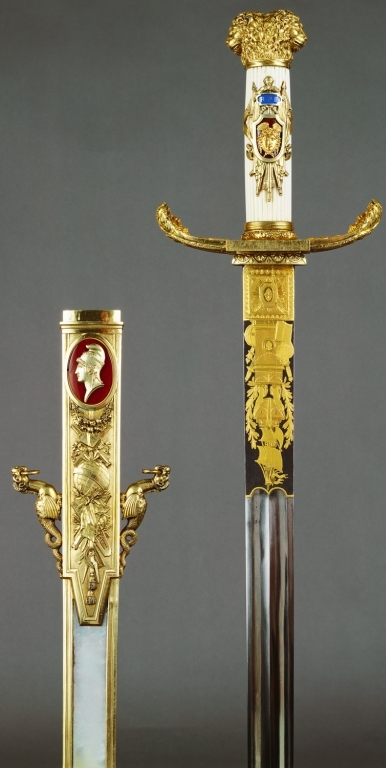 The very slightly barrel-shaped, longitudinally-reeded, ivory grip, which is of oval section, is set on each face with a silver-gilt panel in the form of a military trophy, including in the middle a Roman standard bearing the letters 'R.P.F', in gold in reserve against a pale blue composition ground. In the centre is a shield with a deep red compositon ground charged with the head of Mercury in gold in low relief. The silver-gilt ferrule towards the blade includes a torus moulding cast and chiselled with a wreath of oak leaves. The straight, double-edged blade, which is of flattened-lenticular section at the hilt, has two adjacent fullers of medium width flanking the central line, starting from the hilt and running right to the obtuse tip, which has convex edges. A panel at the hilt is overlaid with gold and engraved and punched on one face with a Roman scutum and two arrows in saltire, in a sunburst, and on the other with a cobweb-like devise, each in a frame, respectively edged with acanthus tips and laurel wreath. Beyond is a blackened and matted panel engraved and richly gilt on one face with a ship in full sail, viewed from her bows, supported by two hands whose wrists entwined by laurel branches, all on a plinth on which hangs a medal charged with a flaming heart, and all between a sword, owl and book on the dexter side, and a sword, flambeau and globe on the sinister side. On the other face are a laurel wreath, a balance, and a hand mirror with a serpent entwined about its handle, all supported by an upright spear arising from a flaming, winged tub, all between oak branches and set upon a pedestal ensigned with a triangle whose apex rests on a disk, and all between two arrows and a celestial globe on the dexter side and two cornucopiae on the sinister side. The scabbard has a wooden lining overlaid with plaques of mother-of-pearl, all framed in silver gilt, and four silver-gilt mounts. The locket is decorated in low relief on each side with a trophy of the Liberal Arts pendent from an oval cartouche framing a profile classical head viewed from his left, against a red composition ground on the one side, Liberty wearing a Phrygian cap and, on the other, Science with a diadem of stars. Beneath each of these cartouches hangs a swag of fruit and leaves. On each side of the locket projects a grotesque winged beast, in full relief, holding in its mouth a loose-ring for the baldrick. The chape is decorated with a tripod altar with clawed feet resting on an iron plinth consisting of a rectangular moulding, flanked towards the blade by a caveto moulding and, on the other side, by a shallow step which forms the end of the scabbard. The two other mounts take the form of broad bands with aprons above and below. The upper one is decorated on each face with a lion’s mask within a mandorla-shaped frame surrounded with scrolls of attenuated acanthus foliage, all applied against a red composition ground. Its aprons are half circles framing half a stylized flower. The lower one is similarly decorated with a globe in its stand. Its aprons are triangular, each framing an upright flowering plant.